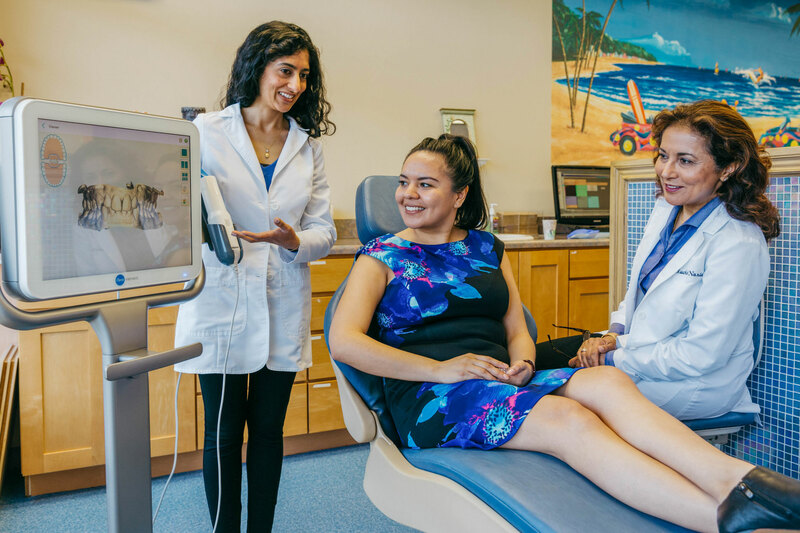 At Nanda Orthodontics, we take the time to get to know our patients and their oral health needs and offer a wide range of services to ensure that the treatment you receive is right for you. We are committed to providing exceptional orthodontic care; our doctors and team welcome any opportunity to answer any questions you may have. The team at Nanda Orthodontics has had over 30 years of experience, and is dedicated to exceeding the expectations of each and every patient. We provide a comprehensive approach to your overall dental health working with your general dentist or other specialists every step of the way. We believe in collaboration to personalize your orthodontic care. We understand you are busy and value your time. Nanda Orthodontics is available to place your braces at the same time as your consultation visit. Please call us for more information. Nanda Orthodontics offers no charge for consultations, digital records, emergency visits or your first set of clear retainers. We also provide “All-inclusive” fees which means there are no hidden fees or charges for emergency visits or retainers. We accept most insurance and have flexible, in office financing with no interest. Both Dr. Munisha Nanda and Dr. Ruchi Nanda are highly trained orthodontic specialists committed to bringing you the best results! Dr. Ruchi Nanda has lectured internationally as well as frequently attending lectures, continuing education seminars, meetings, and conventions to further perfect their techniques; use the latest technology and materials, as well as state of the art care. Our orthodontic team includes a unique group that truly cares for each and every patient. They have a gentle, relaxing approach and are experts in their field. They are well educated and informed in orthodontic techniques as well as sterilization procedures committed to making sure you receive the best care. The iTero Element Scanner is a state-of-the-art digital impression system that eliminates the need for messy putty in your mouth. With our iTero Element Scanner, we can digitally capture a detailed 3D model of your teeth and gums. Not only is this process far more comfortable than the old putty based impressions, but it’s faster and can offer a superior clinical endpoint. © 2016 Align Technology, Inc. To learn more visit iTero online. Dr. Nanda is wonderful and very knowledgeable in choosing Invisalign to treat my Tmj. It immediately helped my pain and symptoms and I couldn't be happier! Had my teeth whitened at Dr. Nanda's. Great friendly service and results! Thanks you! Wonderful staff!! Exceptional quality at a affordable price! We have been so pleased, best Orthodontist!